My Love for GSD started when I was born because my mom and dad was staying with my grandfather's house who only have a German Shepherd all through out his Life. I am happy seeing GSD while I am growing up. I met my grandfather's GSD over the years ( Nikki, Sandra and Ina). These pretty dogs are so smart. 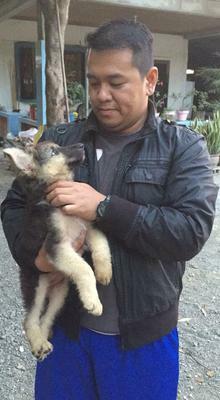 My grandfather really loves his GSDs and he was so generous of the dog that he even give all the puppies for free. When my parents move in the city I never got to have one of my own because we only live in an apartment were huge dogs are not allowed. But that doesn't stop me, I always visit my grandfather every school break and spend time with his German Shepherd. When my Grandfather died I was 21 years old and since I am the eldest of the grand children I inherited Ina, she was so loving and so smart. I brought her in the city so I can take care of her, as I observed she is not happy with the noise so I have to soundproof her cage and since I don't have big yards I have to walk her around every after 2 days during weekdays and every weekend. We had pretty good time together and while I have her my relatives whom my Grandfather gave his GSD puppies tell me a lot of their good experience with their GSDs and I am so happy to hear them especially it also shows how great my grandfather was, It is like after hearing their stories my love for German Shepherd grows much more. Loving for the breed is sharing what joy and love would it bring to your family. I am happy for my Grandfather free love for German Shepherd.